Below is an article published on 22 June 2016, about the famous Heinz brand promoting some of its sugary products as healthy. So, mums and mums-to-be, beware! Food companies who make misleading health claims on children’s products have been put on notice by Australia’s consumer watchdog, which is taking multinational Heinz to court for promoting its sugary Shredz toddler products as healthy. The Australian Competition and Consumer Commission has started legal proceedings in the Federal Court against H.J. Heinz Company Australia Ltd in relation to the food snacks marketed to one-to-three-year-olds. It alleges Heinz is falsely marketing these products as healthy options for young children, when they are not. In a statement, Heinz said it strenuously denied the ACCC allegations and looked forward to defending it’s position. “Heinz takes labelling of products very seriously and compiles with all Australian labelling and food laws,” it said. The Shredz product range includes three varieties – peach apple and veg, berries apple and veg, and strawberry and apple with chia seeds – and has been available in major supermarkets nationally since at least August 2013. They are predominantly made from fruit juice concentrate and pastes. “These products contain over 60 per cent sugar, which is significantly higher than that of natural fruit and vegetables – for example, an apple contains approximately 10 per cent sugar,” ACCC chairman Rod Sims said. The ACCC also alleges the Heinz Shredz products are likely to inhibit the development of a child’s taste for natural fruit and vegetables. Particular issue has been taken with the products’ packaging, which features prominent images of fresh fruit and vegetables and statements such as ‘99% fruit and veg’. Mr Sims says major companies have an obligation under the Australian Consumer Law to ensure products’ health claims do not mislead the public. The legal action has been roundly welcomed by dieticians and obesity prevention advocates, including the Obesity Policy Coalition (OPC). “The OPC is pleased to see such strong action from the ACCC against Heinz for potentially misleading parents who are simply trying to do their best to feed their children nutritious food,” OPC executive manager Jane Martin said. “It’s very difficult for parents to know which foods are healthy and which aren’t, particularly for toddlers. I think parents are really trying to make the right choices and they need good, clear, honest information about the nature of the products,” Ms Martin said. “Many parents would be shocked to know that just one 18g serve of Shredz contains almost an entire day’s worth of added sugar for a two-year-old. Paediatric dietitian and nutritionist Hanan Saleh agrees, and says packaged snacks, like Little Kids Shredz, are not a healthy alternative to a piece of fruit. When it comes to making healthy food choices for children, Ms Saleh says parents really need to go back to basics or “paddock to plate”. “Parents should always think twice before picking up anything in packages,” Ms Saleh told AAP. The average piece of fruit only contains about 10g of sugar per 100g and also has fibre and important vitamins and minerals. The ACCC is seeking declarations, injunctions, pecuniary penalties, corrective notices and costs. Heinz is not the only guilty one. According to The New Daily, “in 2014, consumer group CHOICE rated 260 snack foods aimed at children and their lunch boxes, to find which were nutritionally poor”. It found high levels of sugar in servings of products aimed at toddlers and children in a major Melbourne supermarket. How far can we trust these companies when it comes to feeding our kids? Seriously, what are we feeding our kids? Whilst getting ready for our daughter’s birth, my husband and I got overwhelmed by the number of ‘baby products’ out there and we got a little confused about what would be the safest brand for the baby. You only have to wander in the ‘baby products’ aisle of a pharmacy or a supermarket to get an idea. What should we buy then? Or, what should we NOT buy? In February, a jury awarded $72 million to the family of Jacqueline Fox, an Alabama woman who died from ovarian cancer. It was found that there was a link between her ovarian cancer and the Johnson talc she has been using. Apart from this case, Johnson & Johnson is facing 1400 lawsuits involving Johnson’s Baby Powder. That sounds scary! It is alarming that it is only in 2014 that Johnson & Johnson flooded the shelves with new ‘improved’ baby products as it finally managed to remove two harmful ingredients: (1) Formaldehyde, which has been identified by government scientists as a carcinogen, released over time by preservatives, like quaternium-15. (2) 1,4-dioxane, which has been linked to cancer in animal studies, created during a process used to make other ingredients mild. What about those who used the products before 2014? The question is: would you trust Johnson and Johnson’s products for your newborn? Which product to trust? NEARLY 300 baby products on sale in France contain chemicals that have a moderate to elevated risk of causing allergic reactions and health problems, according to a report. The study by the group Women in Europe for a Common Future (link) looked at 341 baby products on sale in supermarkets, pharmacies and specialist shops across the country and found the vast majority included chemicals that carried health risks. The group used criteria set out by the European Union’s Scientific Committee on Consumer Safety and France’s Agence nationale de sécurité du médicament to judge the safety of products. Among the chemicals the group found that were classed as having an “elevated risk” were an allergen (methylisothiazolinone) discovered in 19 products, including baby wipes, a preservative that can have side effects on the reproductive system (phenoxyethanol) and potentially allergenic perfumes in 226 products. The WECF has demanded that these three ingredients be banned from all cosmetic products used by children under three years old. The group found 181 products contained chemicals rated as having a “moderate risk” such as EDTA and sulphates, found in shampoos, bubble bath and wipes. It also noted mineral oils that had been refined from petroleum which could be contaminated with impurities and nanoparticles in skin creams that had yet to have their effects properly evaluated. “We were surprised at the ubiquity of perfumes in almost all the products,” said Elisabeth Ruffinengo of the WECF. The skin of young children is more sensitive and more permeable than that of adults and older children, making the study of the chemicals in baby wipes particularly important. In 2013, the consumer group UFC-Que Choisir also raised the alert over baby wipes when it found that of the 27 brands it tested, 94% contained potentially harmful chemicals. Some well known and widely used brands of wipes are ‘Bebedou’, ‘Bebe Calin’, ‘Pampers’ and ‘Nivea’. According to an article from l’Express newspaper, Bebedou contains phenoxyethanol; Bebe Calin contains methylisothiazolinone, perfume and EDTA; Pampers contains phenoxyethanol and EDTA and Nivea contains phenoxyethanol, methylisothiazolinone and perfume — all potentially harmful chemicals. The article published on 6 March 2016 states that when contacted, the Ministry of Commerce declared they were now going to conduct tests on the wipes. Result of these tests to date? Well, nothing yet. In the meantime, the shelves remain flooded with all the supposedly ‘best’ products for your baby. The body part of a baby which really needs some cleaning up is the bum. And that part is cleaned numerous times a day and over the night too. So, no use spending lots over shower gels, baby baths etc. as you never know what’s in these ‘baby products’. Given the numerous concerns, we are left wondering: which product to trust for our baby? “You’re not the boss of me now! And you’re not so big” sang They Might Be Giants in one of their most famous songs. That’s what we want to say to our technology device. Especially when they rule our day. Here are the 5 strongest signs that prove you are addicted to your smartphone. Not knowing where it is, accidentally leaving it at home or even finding your pocket empty while searching with your hand feel you with an uncomfortable sense of dread, that sometimes leads you to panic. If you feel your smartphone a part of you, a tool you can’t live without, then you have an unhealthy dependence on it. You are in a pubblic place with friends or your family, but you spend more time playing around with your phone than talking and laughing with them. Maybe you are at the dinner table and you regularly feel the compulsion to check your phone or take a picture of the food. Your family and friends even started complainig about how antisocial your behavior has become. During a face-to-face conversation with someone, it’s hard for you to stay focused and concentrate on what you’re talking about. You lose eye-contact too easily with them zoning out and staring into space; and perhaps you start thinking about checking your Facebook notifications, your e-mails or seeing if someone texted you. Watch out: your smartphone is leaving your mind in a hyperactive and constantly distracted state and, more often than not, you find yourself stretching your arm trying to take your phone without even thinking about it. You let your smartphone decide on your daily schedule. Usually every day looks the same with you spend hours and hours along with your head buried in your smartphone screen playing games or scrolling your Facebook wall. You start showing up late for your meetings and even dates with your partner. Your slowly becoming an unreliable person causes unpleasant situations. Philippe Kahn, the man who created the first mobile phone equipped with a camera, surely was not aware of what would have happened. Nowadays, with every smartphone it is possible to document and keep trace of almost everything that happens around us during our day. Moreover – believe me – no one is going to watch or pay attention to the pictures or videos you took when you were at that concert or another certain kind of event. Don’t look at the reality through a screen and enjoy your surroundings, rather than trying not to let things slip away by using your smartphone. The best memories are the ones you fully lived! The smartphone is an incredibile and useful device when used in the right way. But when it ends up making us busier to the point where we lose touch with what is actually important, then we need to make a change. The over- or misuse can be treated following our advises: try out the smartphone fast you can find some posts below and, if you feel like it, send us a picture for our column PHONE FACED DOWN. Are you addicted to your phone? If so, which steps are you taking to remain the one in charge? My husband always tells me that I’m addicted to my phone because whenever I’m free (which means about 30 mins during the day when my daughter naps or after 8.00/8.30 p.m) I tend to be a lot with my phone. However, I don’t have a Facebook nor a Twitter account and rarely write messages at this time. What I do mostly is read the world news on different websites. During the day, whenever I get a message I tend to reply straightaway but when I go to bed my phone is always on silent mode, with ‘vibrate off’. It wouldn’t disturb me to switch my phone off completely either. I must however admit that I also find myself at times with my phone and just checking the weather, the time or just not sure why it’s in my hands. Would you call that addiction? I thought ‘maybe’ … so I took up a few tests (for example the one from Huffington Post) about addiction to phones and fortunately it doesn’t seem like I’m an addict. Well… NOT YET … And anyway, one may argue how far these tests are reliable. Wouldn’t you? Those on a more ‘advanced’ level could also take up tests on whether they are addicted to Whats App or any other social media. It’s great to know that there are numerous apps out there ( Break free cell addiction, Usage Monitoring, Non Intrusive Notifications, Phone Management Tools, Usage Statistics) that can help you get out of this ‘addiction’. These apps help you monitor how often you are using your social media or even your phone and help you monitor your ‘free time’ which you could of course use to do something else (e.g. nurturing your relationships, etc.). And anyway there must surely be more important things to do than getting on social media day and night. You’d agree with that one, right? The first step to overcoming an addiction problem or any problem, is first of all to realise you have one. If you don’t think you’ve got one or you are in complete denial then read no further. But if like me, you think ‘may be’, then try to take a few tests. Maybe it’s not addiction yet and you are simply overusing your phone! Now, does that sound like you? When you check your phone to see the current temperature instead of opening a window, and/or when you check your phone to see the current time instead of looking at the watch that’s right on your wrist. If you are answering emails in a dimly lit reception area while waiting for your massage therapist to de-stress you, you may have a problem. When your kids have to text you their carry-out orders because you’ve lost the ability to retain information that is not received on your phone. When you hope you hit a bunch of red lights on the way home so you can comment on a Facebook post. When one of your daughter’s first drawings of you has a BlackBerry in your hand. When you wake up, you grab your phone and check it before you get up to pee. When you drop a phone on your face because you’re dozing off. When you choose your clothing based on the best pockets to hold your phone. When you are staring at photos you took on your phone while the actual moment is taking place right in front of you. I’ve come through a very interesting article about ‘phone addiction’ by Susan Davis from WebMDFeature which I wanted to share. It’s a great read. Why Smartphones Hook Us In, Plus Tips On Reclaiming Your Time And Concentration. I’ll admit it: I check my smartphone compulsively. And the more I use it, the more often the urge to look at it hits me. In the orthodontist’s office. Walking my kids to school. In meetings. Even while making breakfast. Sometimes it is in my hand before I even know what I’m searching for. Sometimes I tap the screen absent mindedly — looking at my email, a local blogger, my calendar, and Twitter. I’m not the only one struggling with this very modern compulsion. According to a 2012 survey by the Pew Research Center, 46% of all American adults now own a smartphone — up a whopping 25% from 2011. 70% said they check their smartphone within an hour of getting up. 56% check their phone within an hour of going to sleep. 48% check over the weekend, including on Friday and Saturday nights. 51% check continuously during vacation. 44% said they would experience “a great deal of anxiety” if they lost their phone and couldn’t replace it for a week. Whether smartphones really “hook” users into dependency remains unclear. But “we already know that the Internet and certain forms of computer use are addictive,” says David Greenfield, PhD, a West Hartford, Conn., psychologist and author of Virtual Addiction: Help for Netheads, Cyber Freaks, and Those Who Love Them. A true addiction entails a growing tolerance to a substance (think drugs or alcohol) so you need more to get “high,” uncomfortable symptoms during withdrawal, and a harmful impact on your life, Greenfield says. Computer technologies can be addictive, he says, because they’re “psychoactive.” That is, they alter mood and often trigger enjoyable feelings. Smartphones, of course, allow us to seek rewards (including videos, Twitter feeds, and news updates, in addition to email) anytime and anywhere. Is such behavior unhealthy? That really depends on whether it’s disrupting your work or family life, Greenfield says. Such a disruption could be small — like ignoring your friend over lunch to post a Facebook status about how much you’re enjoying lunch with your friend. Or it could be big — like tuning out a distressed spouse or colleagues in a meeting to check email, or feeling increasingly stressed by the fact that everyone else seems to be on call 24/7, so we perhaps we should be, too. According to a 2011 study published in the journal Personal and Ubiquitous Computing, people aren’t addicted to smartphones themselves as much as they are addicted to “checking habits” that develop with phone use — including repeatedly (and very quickly) checking for news updates, emails, or social media connections. That study found that certain environmental triggers — like being bored or listening to a lecture — trigger the habits. And while the average user checks his or her smartphone 35 times a day — for about 30 seconds each time, when the information rewards are greater (e.g., having contact info linked to the contact’s whereabouts), users check even more often. Besides creating a compulsion, smartphones pose other dangers to our mental life, says Nicholas Carr, author of The Shallows: What the Internet is Doing to Our Brains. “The smartphone, through its small size, ease of use, proliferation of free or cheap apps, and constant connectivity, changes our relationship with computers in a way that goes well beyond what we experienced with laptops,” he says. That’s because people keep their smartphones near them “from the moment they wake up until the moment they go to bed, and throughout that time the devices provide an almost continuous stream of messages and alerts as well as easy access to a myriad of compelling information sources. Carr, who writes extensively in The Shallows about the way that computer technology in general may be diminishing our ability to concentrate and think deeply, does not have a smartphone. “One thing my research made clear is that human beings have a deep, primitive desire to know everything that’s going on around them,” he says. Be conscious of the situations and emotions that make you want to check your phone. Is it boredom? Loneliness? Anxiety? Maybe something else would soothe you. Be strong when your phone beeps or rings. You don’t always have to answer it. In fact, you can avoid temptation by turning off the alert signals. Be disciplined about not using your device in certain situations (such as when you’re with children, driving, or in a meeting) or at certain hours ( for instance, between 9 p.m. and 7 a.m.). “You’ll be surprised and pleased to rediscover the pleasures of being in control of your attention,” Carr says. One group of business people at The Boston Group, a consulting firm, discovered just that when they participated in an experiment run by Perlow. As described in her book, Sleeping with Your Smartphone, the group found that taking regular “predictable time off” (PTO) from their PDAs resulted in increased efficiency and collaboration, heightened job satisfaction, and better work-life balance. Four years after her initial experiment, Perlow reports, 86% of the consulting staff in the firm’s Northeast offices — including Boston, New York, and Washington, D.C. — were on teams engaged in similar PTO experiments. To manage my own smartphone well, more smartly, I weaned myself away from it. I started by not checking it for 15 minutes at a time, then 30, then 60 (unless I was dealing with an urgent situation). I decided to avoid using the web browser on the smartphone unless I truly needed information (such as an address or phone number). And I swore off using social media on it entirely. I also made a firm commitment to not text, email, or surf the web on my smartphone while driving. The result? The author of the article claims that after a few days of self-discipline, she found she was concentrating better, was more aware of her surroundings and was more relaxed. As I said earlier, I’m not addicted to my phone but I could well be on the way to it if I’m not careful. The most active app on my phone is Whats App. I have decided to switch off my ‘alerts’ for whats app messages and will try to check my phone less often. Like Susan Davis, would you be able to manage your smartphone use? I am definitely going to try. Fish and Mercury — it’s important to know how much of which fish type you are eating. When discussing fish with my young niece, I became quite alarmed to see that she didn’t have a clue about mercury level in fish. She had marlin for lunch! I thought I’d draw mums’ and dads’ attention to ‘Fish and Mercury’ so that they are better aware of the risks involved with eating some particular types of fish. The following article from the New South Wales (Australia) website sums it all up and can be quite helpful to choose how often to give which type of fish to children and also for pregnant mums and women planning pregnancy. It’s good to eat enough fish, especially when pregnant or breastfeeding. Fish are a valuable source of protein, minerals, vitamin B12 and iodine. They are low in saturated fat and contain omega-3 fatty acids which are important for the development of babies’ central nervous systems before and after birth. Most fish in Australia are low in mercury but some are higher and too much mercury can harm developing nervous systems. It’s best to know the mercury levels of different types of fish and how often to eat each type. Mercury from fish is generally not a health consideration for most people, it is mainly an issue for women planning pregnancy, pregnant women, breastfeeding women and children up to six years. Ready-to-each, chilled seafood, such as raw sushi, sashimi & oysters or pre-cooked prawns and smoked salmon can be risk for pregnant women because of listeria. Our guidelines have more information about listeria and what to avoid during pregnancy. Mercury occurs naturally in the environment and accumulates in the aquatic food chain, including fish, as methyl-mercury. All fish contain some methyl-mercury, but most fish in Australian waters have very low mercury levels. Mercury content is not reduced by processing techniques such as canning, freezing or cooking. Many fish have low mercury levels. These fish can be eaten more frequently, up to two to three times per week. It is generally safe for all population groups, including pregnant women, to consume 2-3 serves of any type of tuna or salmon a week, canned or fresh. Canned tuna usually has lower mercury levels than other tuna because tuna used for canning are smaller species that are caught when less than one year old. Fish oil products and supplements are not a major source of dietary mercury and there is no recommendation to restrict consuming them because of mercury. Crustacea (including prawns, lobster and crabs) and molluscs (including oysters and calamari) are not a concern because they generally contain lower levels of mercury and are usually consumed less often than finfish. Breastfeeding mothers can continue to eat fish. Fish are rich in protein and minerals, low in saturated fat, and contain omega-3 fatty acids, which are important for the development of your baby’s central nervous system, even after birth. Although it’s important to continue to eat fish while you are breastfeeding, you need to be careful about which fish you choose. Some fish may contain mercury levels that can harm a baby’s developing nervous system if too much mercury is passed to them through breastmilk. To safely include fish as an important part of a balanced diet while you are breastfeeding, follow the same guidelines provided to pregnant women. The healthy nutrients found in fish are excellent for growing children. Simply follow the guidelines for children up to 6 years. Like all foods, fish should be eaten as part of a varied and balanced diet. Over-consumption of any single food group, particularly to the exclusion of other foods, is not recommended because it can lead to dietary imbalances and may increase your intake of potentially harmful substances, such as mercury. If you have been eating more than 2-3 serves of fish in the past, you can follow the recommended number of weekly portions and your mercury levels will return to normal fairly soon. Mercury levels will generally halve within several months, providing you follow the dietary advice and limit the amount of Shark (Flake) and Billfish (Swordfish, Marlin) you consume. If you are concerned about your mercury levels, your doctor can order a blood and/or urine test. If you choose to eat more than 2-3 serves of fish per week it is important to eat a variety of fish, and avoid those that could have elevated mercury levels, such as Shark (Flake) or Billfish (Swordfish, Marlin). Have you had any issue with mercury level in your blood or that of your child? When did you last have a blood test? Is Your Child Eating Too Much Salt? Whenever I eat at my parents’ or at the in-laws’, I always think the food has too much salt. And what’s worrying is that I’m the only one! Everyone keeps telling me I have a problem with my taste buds! You know what? I found out that I DID! It was my taste buds because I wasn’t used to eating that much salt in food. It’s all relative: my parents and in laws find the salt level ‘normal’ but for me it is not. It’s all a question of being used to salt. That’s why I am so amazed when mums tell me they add salt to their babies’ food when they start on solids, as early as 5 to 6 months old! They argue they want to make sure the baby likes the food by making it more tasty. What they do not know, unfortunately, is that babies do not need additional salt and they are the ones who are getting them used to that taste! The Health Foundation in Australia recommends that an adult consumes less than 6 grams of salt a day, that’s about 1 teaspoon. And we are talking here not only about salt that we add to food when cooking but also to hidden salt in all the foods that we eat. The Health Foundation aims at reducing premature death and suffering from heart, stroke, and blood vessel disease in Australia. It warns about the high intake of salt which can increase blood pressure and lead to a high risk of many other diseases. It is alarming to know that the average Australian consumes about 9 grams of salt everyday. I don’t always check the labels of food products that I buy but I always try to buy healthy food and avoid processed food and take aways as these are so high in salt. There is now evidence that a high intake of salt in children also influences their blood pressure and can lead them to develop many diseases later in life such as high blood pressure, osteoporosis and even obesity. How children eat when they are young heavily influences their food choices and likings in later life. If they have been used to eating salty food, this is what they will like later in life. It is better for them not to be encouraged to develop a preference for salt when they are little in order to avoid exposing them to all the health risks related to high salt intake. Children should rather be encouraged to eat healthy snacks such as fresh fruits, dried fruits, fresh vegetable sticks and yoghurt. Their food should be cooked without salt if possible. There is already natural salt in vegetables and the taste of other foods such as meat, chicken, etc. can be enhanced by adding spices and herbs. I have tried it and it does work. It is all a question of getting used to eating less salt or no salt at all. If you do it gradually then very soon you will find it hard to eat out or to buy take away! According to the Health Foundation and other health institutions this is how much salt children can eat per day in order to stay healthy and to avoid risks linked to over-consumption of salt. Babies’ kidneys are too immature to deal with added salt and anyway, they require very tiny amount daily. Both breast milk and baby formula consist of that required amount of salt and do not need any added salt to their food. When babies start on solids, although their food may taste very bland to us (remember it’s all a question of being used to salt), salt must not be added. As far as possible it is best to feed baby home made food and avoid processed food as even sauces and other stocks contain too much added salt. 75% of our salt intake come from the ready-made and processed foods. It is always important to check the nutritional information on food products that you plan to give your children and choose those with low salt content. Be mindful of products such as bread, baked beans, crisps, olives, cheese and even biscuits which already contain salt. When choosing breakfast cereals, make sure you are choosing one which has a low salt level. I used the recommendations of Choice Magazine for my baby. It compares various products and lists their salt and sugar levels. When eating out, be mindful what you are feeding your child. 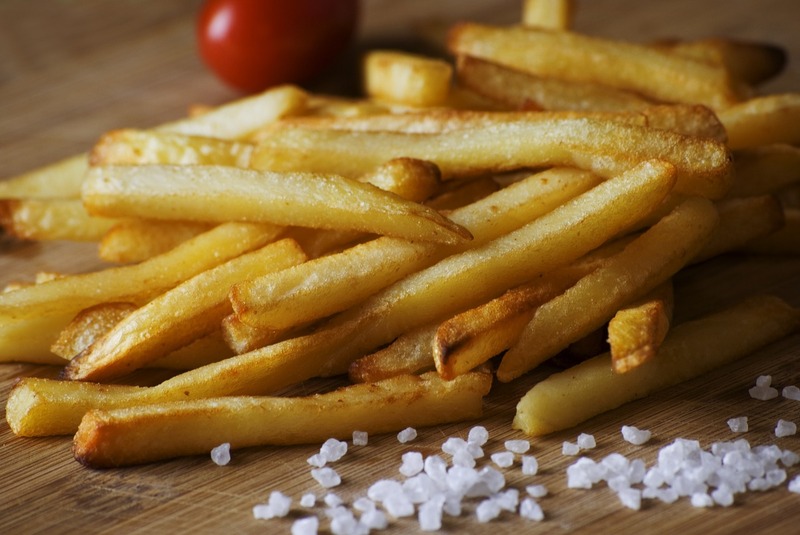 A large portion of chips can contain over 1g of salt and 4 slices of bread can provide 2g of salt; so in only one meal your child can eat much more salt that he is required to eat over a few days!You can use the following as a guide: food containing more than 0.6g of sodium per 100g is considered as high in salt. Making sure your child doesn’t eat too much salt means you’re also trying to ensure that he doesn’t develop a taste for salty food; this will makes him less likely to eat too much salt as an adult. As mentioned earlier, if you are already giving your child too much salt, just decrease it gradually. It would be a good idea to do it for the family as a whole at the same time. The whole family will benefit from it. It makes so much sense that salt is often referred to as the slow poison and we definitely don’t want that for us nor for our kids, do we?